2-Minute Reveal Masque | Net Wt. 2.5 oz. 24/7 Barrier Balance Cream | 1.5 fl. oz. Powerful, synthetically-produced messaging defensin peptides featuring a stand-alone breakthrough NATURAL mechanism of action. 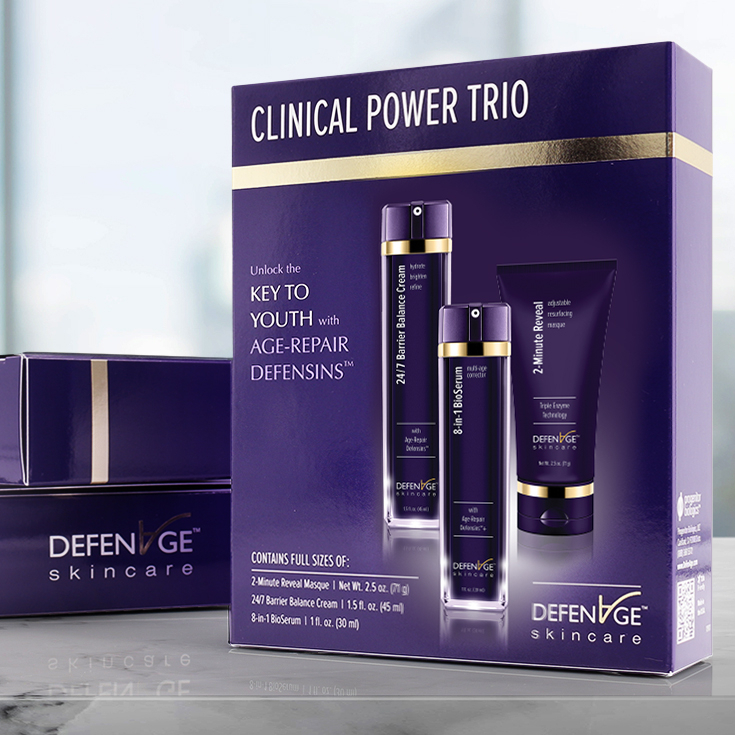 Patent-pending and EXCLUSIVELY available in DefenAge® Skin Care. Soothes, revives skin’s natural moisture barrier, renews the feel of skin firmness and elasticity, brightens overall skin tone. 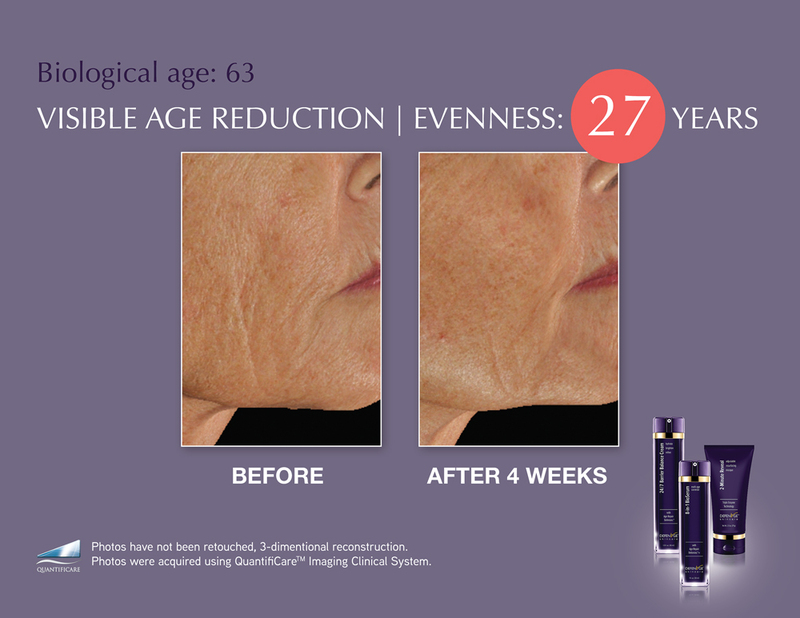 Promotes hydration and improves texture for remarkably smooth even skin. Keeps skin calm. Strongest, fastest, most effective soothing ingredient from the sea. 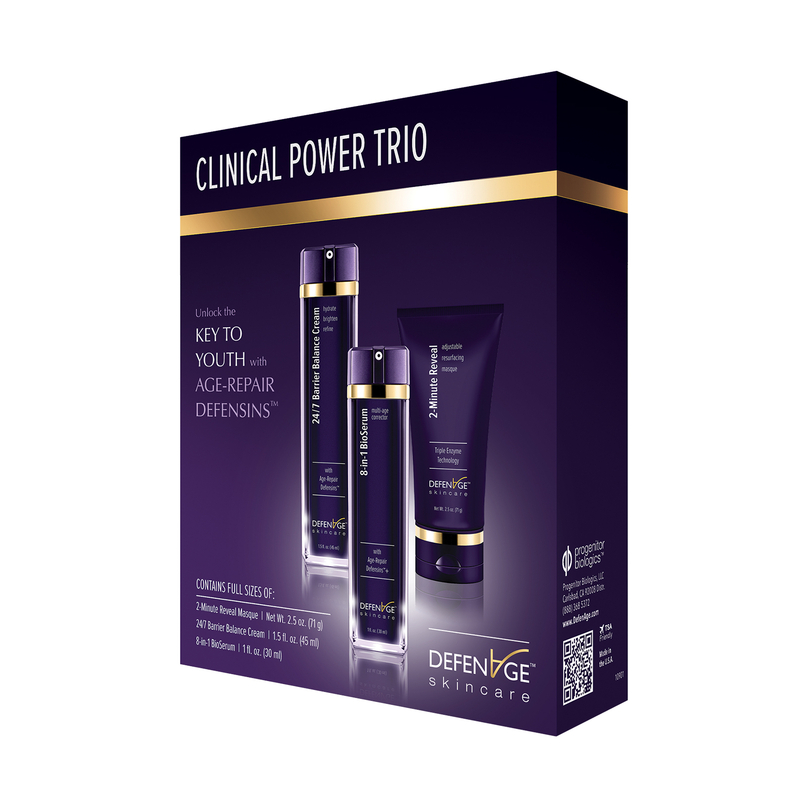 Special “know-how”-protected fine blend of antioxidant- and hydrating technologies and enzymes. Parabens or Formaldehyde-releasing preservatives, Sulfates, Irritating acids or Abrasives, Strong emulsifiers, Chemical sunscreens, Mineral oil, Petrolatum or Paraffin, Colorants, Phthalates, BPA, BHT/BHA, Propylene Glycol, Triethanolamine, Gluten Ingredients (no wheat, oats, barley). 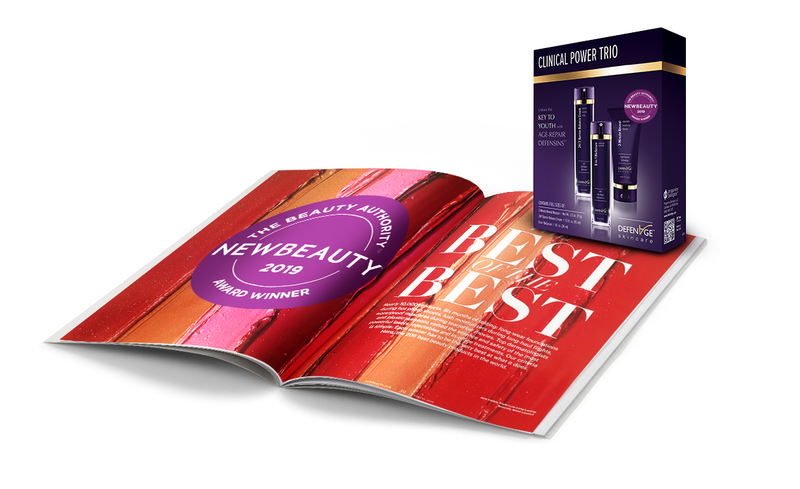 Free from Animal- or human- derived ingredients. Not tested on animals. Dermatologist-Tested. For external use only. Keep out of eyes. If product enters eyes rinse thoroughly with water. Discontinue use and consult a physician if irritation or allergy develops. Keep out of the reach of children. 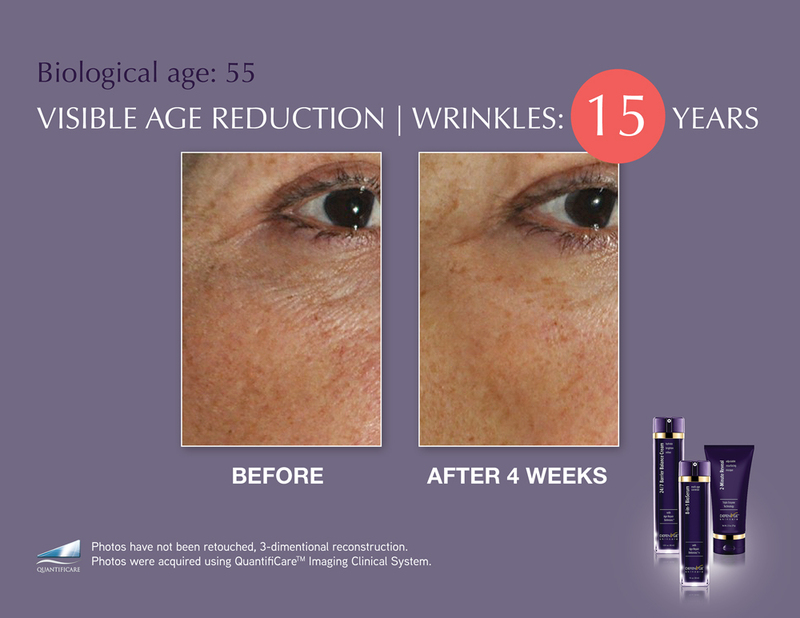 * A six-week clinical study of participants ages 48 to 68 using this regimen: 2-Minute Reveal Masque one-to-two times a week plus 24/7 Barrier Repair Cream and 8-in-1 BioSerum twice daily. 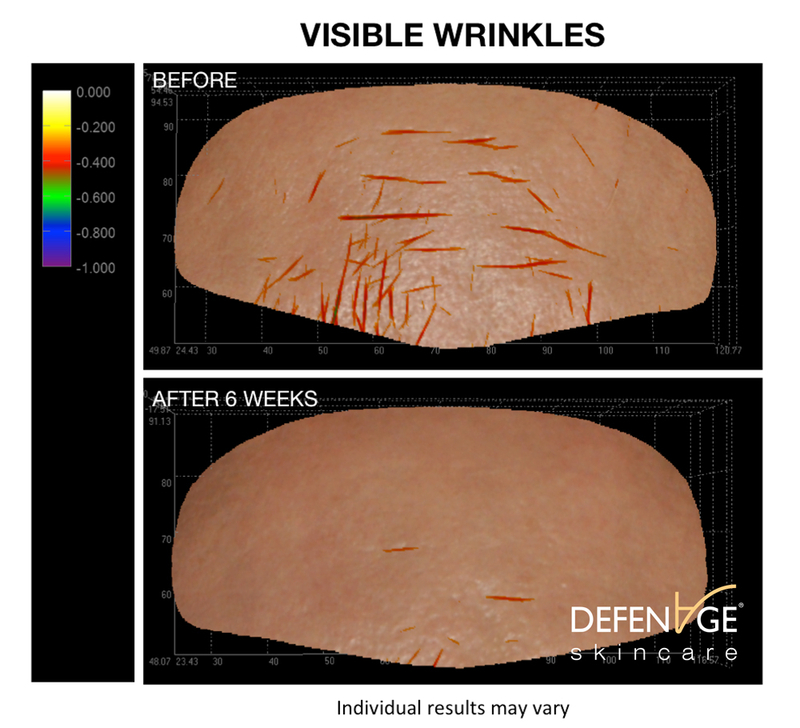 Participants realized an overall improvement in skin evenness (a global measurement of the skin surface roughness including pore and wrinkle size and the even or coarse texture of the skin) as measured using QuantifiCare™ Clinical Imaging System as compared to QuantifiCare’s Reference Population Database of normal aging skin for that age group. 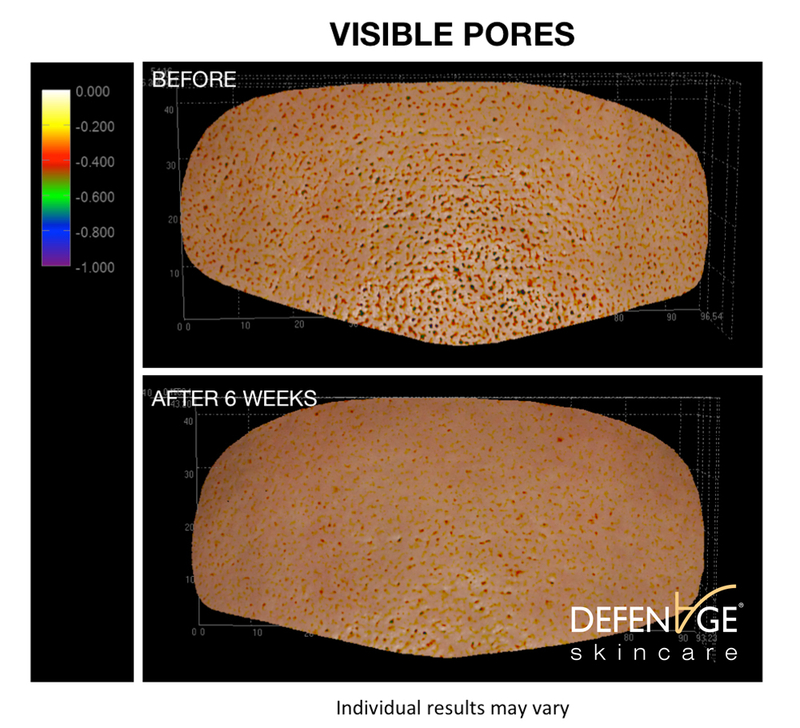 DefenAge “youthened” skin appearance up to 18 years (+ or – 4, average per group). Individual results may vary. Butylene Glycol, PEG-8, Tapioca Starch, Sucrose, Titanium Dioxide, Hydroxyethyl Acrylate/Sodium Acryloyldimethyl Taurate Copolymer, Squalane, Polysorbate 60, Carica Papaya (Papaya) Fruit, Papain, Aloe Barbadensis Leaf Juice, Lactobacillus/Pumpkin Ferment Extract, Lactobacillus/Punica Granatum Fruit Ferment Extract, Sea Whip Extract, Cananga Odorata Flower Oil, Citrus Aurantium Dulcis (Orange) Peel Oil, Caprylic/Capric Triglyceride, Lactic Acid, Phenoxyethanol, Caprylyl Glycol, Ethylhexylglycerin, Hexylene Glycol. Water (Aqua), Carthamus Tinctorius (Safflower) Oleosomes, Butyrospermum Parkii (Shea) Butter, Macadamia Integrifolia Seed Oil, Niacinamide, Yeast Extract, Ammonium Acryloyldimethyltaurate/ VP Copolymer, Helianthus Annuus (Sunflower) Seed Oil, Phospholipids, Alpha-Defensin 5, Beta-Defensin 3, Hyaluronic Acid, Ophiopogon Japonicus Root Extract, Hydrolyzed Candida Saitoana Extract, Sea Whip Extract, Lycium Chinense Fruit Extract, Vaccinium Angustifolium Fruit Extract, Vaccinium Marcrocarpon Fruit (Cranberry) Fruit Extract, Rosmarinus Officinalis (Rosemary) Leaf Extract, Panthenol, Albumin, Tocopheryl Acetate, Ubiquinone, L-Alanyl-L-Glutamine, Leuconostoc/Radish Root Ferment Filtrate, SH Oligopeptide-1, Xanthan Gum, Phytic Acid, Polysorbate 20, Caprylic/Capric Triglyceride, Phenoxyethanol, Caprylyl Glycol, Ethylhexylglycerin, Hexylene Glycol, Potassium Sorbate, Sodium Chloride, Fragrance. Water (Aqua), Cyclopentasiloxane, Glycerin, Niacinamide, Sinorhizobium Meliloti Ferment Filtrate, Dimethicone, Polysorbate 20, Dimethicone/Vinyl Dimethicone Crosspolymer, Lauryl PEG-9 Polydimethylsiloxyethyl Dimethicone, Ammonium Acryloyldimethyltaurate/VP Copolymer, Phospholipids, Alpha-Defensin 5, Beta-Defensin 3, Palmitoyl Tripeptide-38, Sodium Hyaluronate, Arabidopsis Thaliana Extract, Sea Whip Extract, Ergothioneine, Helianthus Annuus (Sunflower) Seed Oil, Rosmarinus Offinalis (Rosemary) Leaf Extract, SH Oligopeptide-1, Tocopheryl Acetate, Ubiquinone, Leuconostoc/Radish Root Ferment Filtrate, Albumin, L-Alanyl-L-Glutamine, Caprylic/Capric Triglyceride, Cetyl Hydroxyethylcellulose, Lecithin, Hydroxypropyl Cyclodextrin, Phytic Acid, Phenoxyethanol, Caprylyl Glycol, Ethylhexylglycerin, Hexylene Glycol, Sodium Chloride. Once or twice a week after cleansing, dry skin thoroughly. Apply a dollop of masque about the size of a quarter to face and jawline. Using dry fingertips, gently massage masque in a circular motion for 20 seconds or less depending on skin sensitivity. 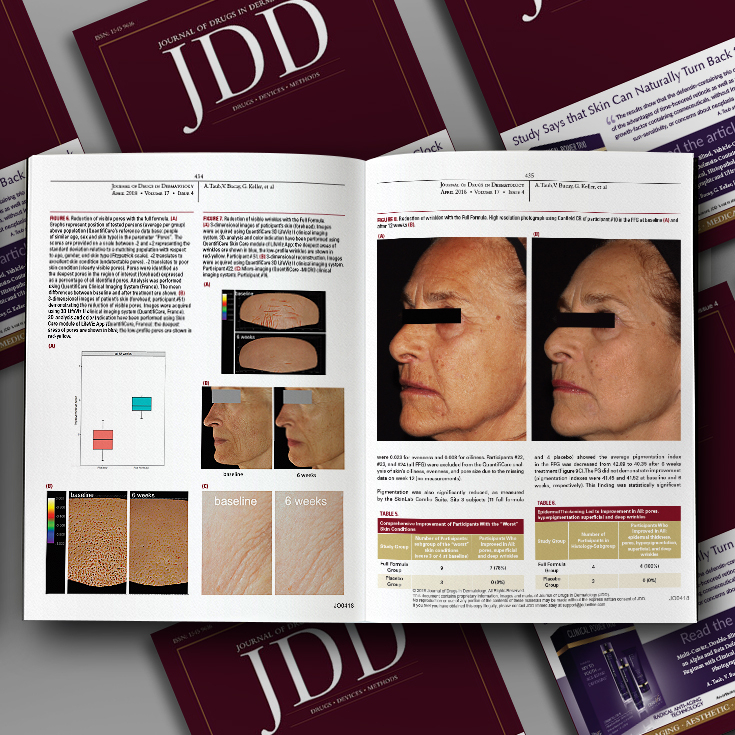 Focus on nose, forehead, chin and other areas where blackheads and roughness develop. Avoid eye area. Wait 2 minutes. With moistened fingertips, massage until crystals are completely dissolved. Rinse face thoroughly. 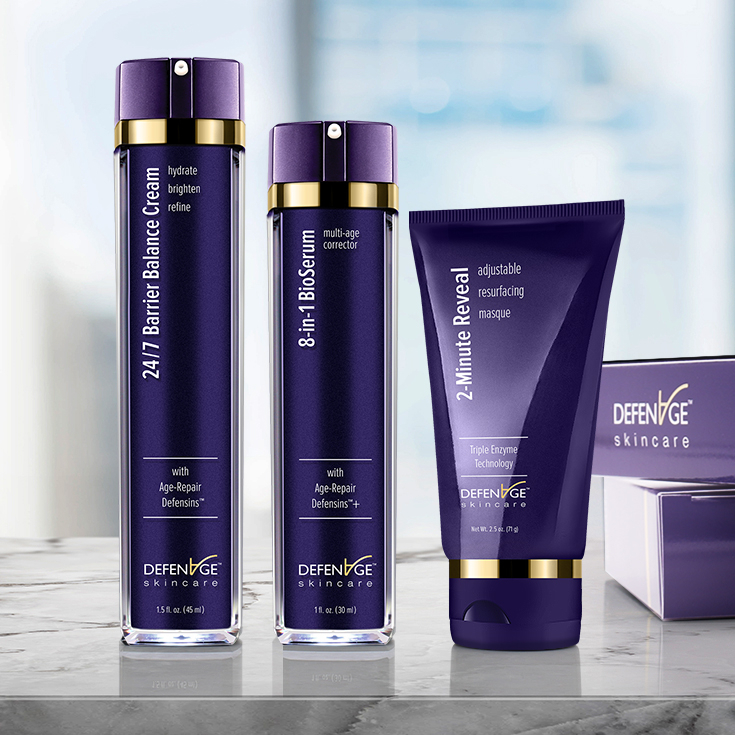 Follow with 24/7 Barrier Balance Cream. 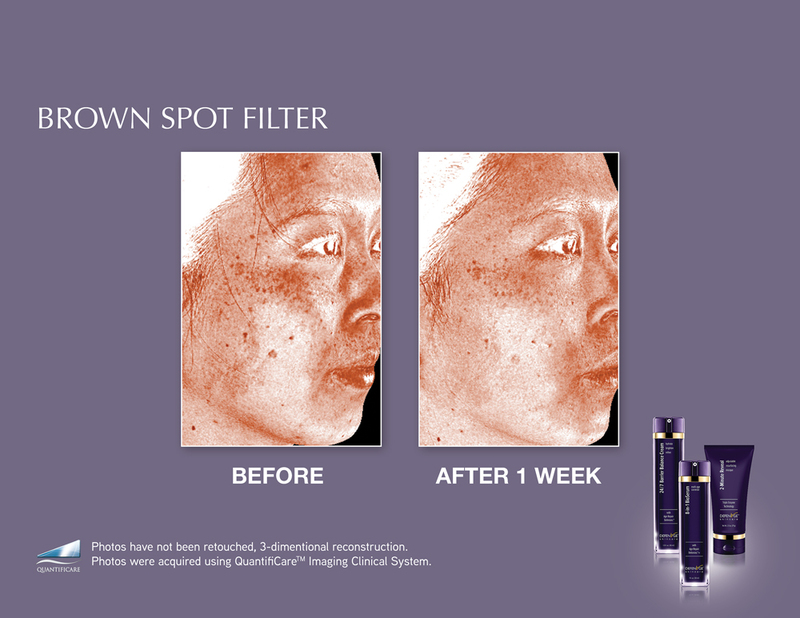 Not recommended for acne, rosacea, extremely sensitive or abraded skin. Twice daily after cleansing, place 3-4 pumps of cream onto fingertip. While skin is still moist, lightly massage with fingertips over entire face, neck and décolleté. Avoid eye area. 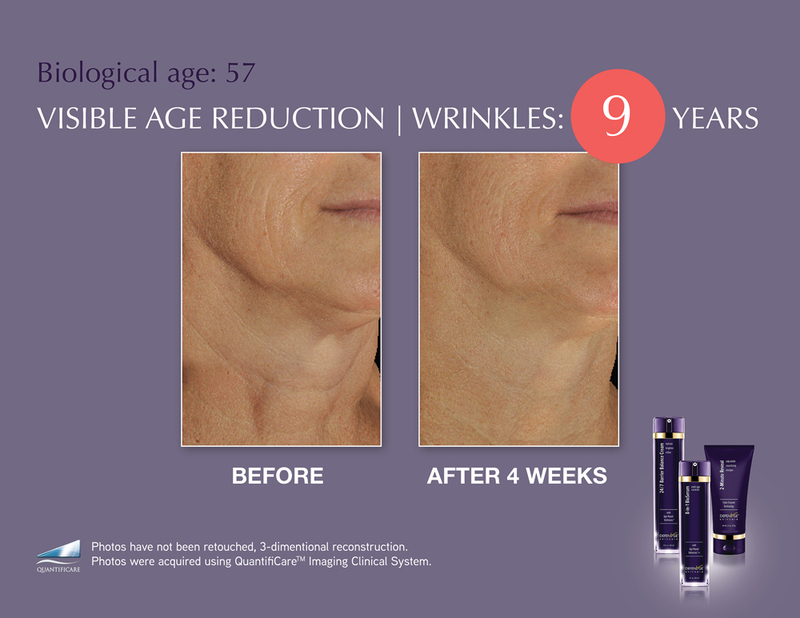 Wait 30 seconds then apply 8-in-1 BioSerum. 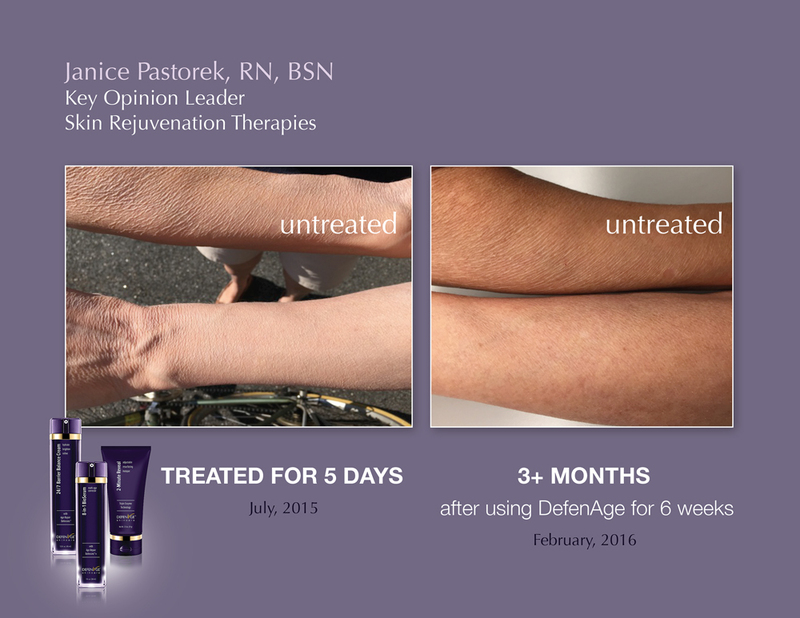 Effective for all skin types, ages, and ethnicities. 30 seconds after applying 24/7 Barrier Balance Cream, place 2 pumps serum onto fingertip. While skin is still moist, lightly massage with fingertips first around eyes, then over entire face, neck and décolleté. Follow with sunscreen. 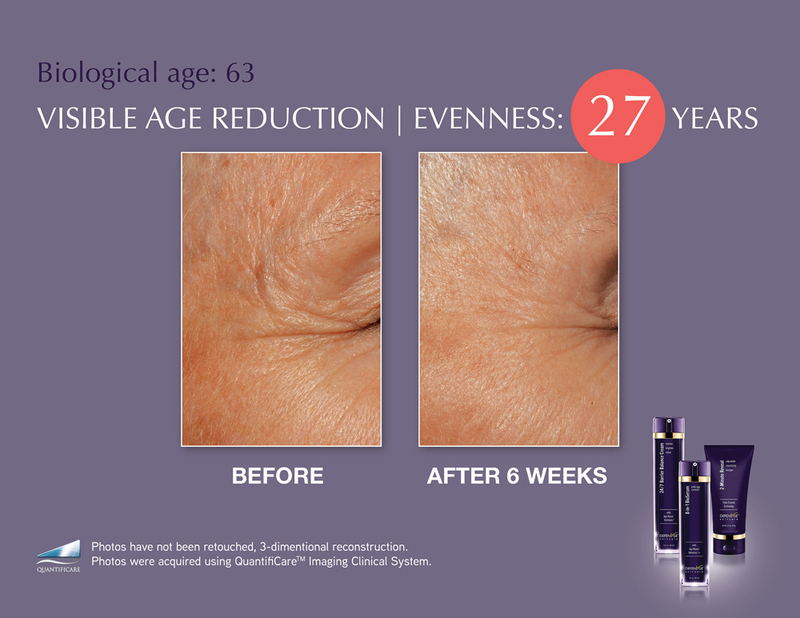 Effective for all skin types, ages, and ethnicities.